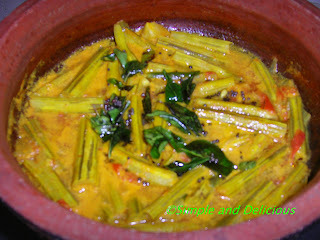 Muringakka / Drumsticks Curry | Simple and Delicious ! Cut and peel drumsticks , wash it. Cook the chopped onion, tomato with salt and all powders and enough water to cover it. Cook till the onion is done. Add green chilly slit and drum stick pieces. When the drumstick pieces are done add coconut milk. When it begins to boil switch off fire. Heat oil in another pan, add mustard seeds. Add curry leaves, red chilly pieces. Stir and pour into the curry. You can cook ash gourd, cucumber and other veggies like this. Since drum sticks need less cooking time, don’t add it in the beginning. But for other vegetables you can add in the beginning. This is a very tasty curry. You can add more chilies if needed.Usually I prepare less spicy dishes. seenakutty, is that chatti from kerala? i am sure the curry tastes much better in that. i have not cooked in chatti. muringakka curry kollam! you are very kind..am doing well. drumstick tree(??) grows very well here than in India. so we are lucky to get fresh leaves and drumsticks..
thanks..try this when u get fresh drumsticks. yeah, my friend brought this chatti from Kerala for me..I have some chattis and make fish and veggies in them. surely, the taste is good! Muringakka curry is looking nice...I have not used coconut milk in this type of curry....I think i will give this a try. Hey,this is something new. Another dish to prepare in my precious chatti :). Thanks. Yeah, chatti is precious for us..try this one in it..
looks like you made with fresh drumsticks in the clay pot, the taste must be really good. Many thanks to you Mocha for leaving your nice comment here.Very happy to know that you liked it.There is nothing special in my recipes, but all we used to cook at home! Your Muringakka curry turned out fab, and my family loved it.I guess the coconut milk in it did wonders. I make it a different way. Do visit my blog www.indianfoodiecorner.blogspot.comand try it out. Welcome, hope to see you again, best wishes! hello seena,can you please suggest some lunch recipes without coconut?thank you.